Bates’ ninth annual Clean Sweep, a “garage sale” of usable goods donated by departing students, raised a record $21,400 in proceeds that will be divided among local nonprofit organizations. 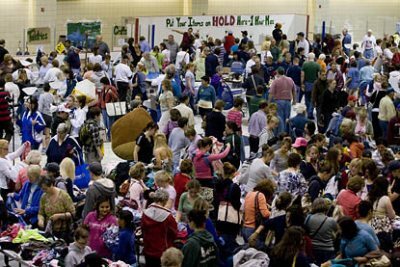 A community tradition, the sale on June 20 drew swarms of eager bargain-hunters to the college’s Underhill Arena, on Russell Street. Items donated by Bates students and other members of the college community also included sporting goods, housewares, books, toys, clothes and shoes. Bates is one of a number of colleges and universities nationwide that benefit both local nonprofit organizations and the environment by selling useful possessions donated by students as they head out at the end of the academic year. The sale both keeps unwanted possessions out of the waste stream and raises money for the organizations. Nonprofits supply volunteers to help staff the event, and in return receive a share of the proceeds proportionate to the amount of time volunteered. The beneficiaries of the event were: the Caleb Garden Club; Common Ties Mental Health Services; First Universalist Church, Auburn; the Justice, Ecology and Democracy Collective, Greene; Life Center; Literacy Volunteers-Androscoggin; Lots to Gardens; Maine Fair Trade Campaign; Maine People’s Alliance; New Beginnings, Inc.; the St. Andre Home; the Share Center, Auburn; Somali Bantu Community Association; and TriCounty Mental Health Services. Last year’s sale raised $11,897, divided by 14 local nonprofit organizations. The total for 2007 was around $18,000.